If you are getting bored with plain chicken breast, then you need to start getting a bit creative and that starts with herbs and spices. Paprika goes so well with chicken and you would be surprised how many recipes include it. Actually, if you have made a few of my recipes, you would not be surprised at all. It is a bit of a running joke with Mr HHH and I, when he tries something new I have made he saying “does it have paprika in it?” and I say “of course”. Some people don’t like the smoky taste of paprika, but you can get the smoked paprika or normal paprika that does still have a hint of smokiness to it, but not as much. This recipe is part of my tapas series and is really simple to make. The idea of tapas is lots of little dishes for people to share, so as you are making a lot of different things, you don’t want to be spending too long making each one and be stuck in the kitchen all day. The longest part of making this is leaving the chicken to marinade. But whilst that is happening you can be getting on with making something else. I guess this is quite garlic garlic heavy, but you can always reduce it to suit your taste. I only realised how much I love garlic the other day when a reader commented saying “wow – that is a lot of garlic”. I guess it is to some, but I love the stuff. I don’t go as far as eating it raw though. This are also really good to throw together to have with a salad or to put on the BBQ when the warm weather comes back again. 1) Take 4 normal sized wooden skewers and cut in half to make 8 smaller skewers. You can keep them at their normal size, but for tapas I think they look better smaller. Soak them in a bowl of cold water for 30 minutes. 2) Put all the ingredients into a bowl and mix well and put in the fridge for 30 minutes. 3) Thread the chicken and red pepper onto the skewers and then grill (broil) for 20-30 minutes, turning every 5 minutes. Make sure they are cooked through before serving. Oh, and have you seen out Halloween Stuffed Peppers? Since BBQ season is here in the UK now (had a couple already!) I was looking for some nice recipes to make something different than the typical burgers and sausages. These skewers look incredible and I a lot of love at the moment for Paprika so will have to give these a go! 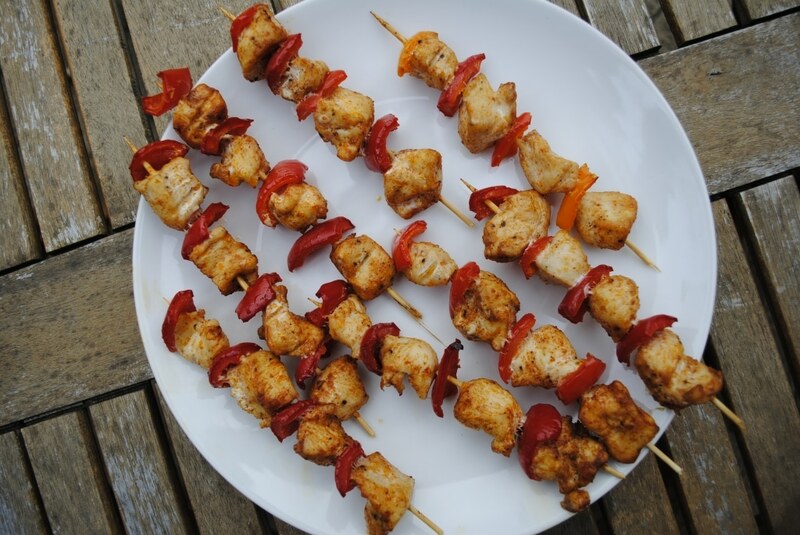 Garlic, smoked paprika, peppers – love all these things, these kebabs must be delicious! I am going to make these to go with a salad tomorrow. I think I might add some cous cous too. I am a big paprika fan too. I love Spanish food, so that might be why.